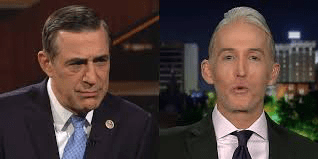 Ah, Donald House snooping?…Remember Darrell Issa? Donald Trump has been crying about the begging of the House Oversight Democratic effort coming his way…. Say’s the Democrats are essentially picking on him and his admin? He might wanna brea down and ask Barack Obama about Darrell Issa and Trey Gowdy.…. To some extent, Trump’s frustration is understandable. The Democrats are planning an aggressive slate of investigations against him and his administration. Earlier this week, the chairman of the House intelligence committee, Adam Schiff, announced that his committee would continue to probe potential ties between the 2016 Trump campaign and Russia, as well as dig into whether Trump’s financial interests are influencing his decision-making. House Democrats also began the process that would allow them to formally request Trump’s tax returns. And in a hearing scheduled for Friday, Democrats are expected to grill acting Attorney General Matthew Whitaker about whether he has passed information about special counsel Robert Mueller’s investigation into Russian meddling in the 2016 election to Trump or Trump’s private legal team (although Whitaker now says he won’t appear if Democrats don’t relinquish their power to subpoena him).